You can choose to arrive to the city of SANTIAGO in Chile, or to BUENOS AIRES, in Argentina. We would be glad to help you with your international air reservations if required. 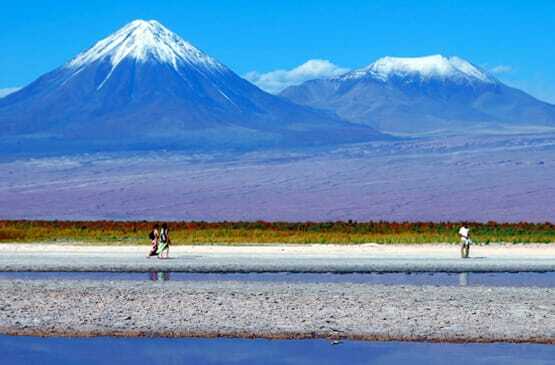 SANTIAGO is Chile’s capital, a city of 7 million people located in the heart of the Andes Mountain Range. Santiago's steady economic growth over the past few decades has transformed it into a modern metropolis, making it home to growing theater and restaurant scenes, extensive suburban development, dozens of shopping centers, and a rising skyline, including the tallest building in Latin America. BUENOS AIRES is the capital and largest city of Argentina, and the second-largest metropolitan area in South America. It is a top tourist destination and is known for its European-style architecture and rich cultural life, with the highest concentration of theatres in the world. There are direct non-stop flights to Buenos Aires from several US cities like Dallas, Atlanta, Miami and New York, as well as from European cities like London, Frankfurt and Madrid. We recommend you arrive at least 2 days before your scheduled Patagonia travel dates in case there are flight delays or cancellations. We have had several occasions where guests missed the start of their trip because of flight delays and they had to skip a couple of days of their tour. We will be glad to help you with your domestic flight reservations in both Chile and Argentina if required. For those arriving in Santiago, Chile, there are domestic flights down to Punta Arenas in Patagonia with both LAN and SKY Airlines. Our trips begin in Punta Arenas when starting on the Chilean side. The duration of direct flights from Santiago to Punta Arenas is normally 3h 15min. Many flights to Punta Arenas also have a brief stop over in Puerto Montt and those have a duration of just over 4 hours. 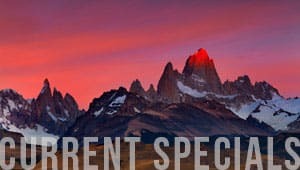 For those arriving to Buenos Aires, Argentina, there are direct domestic flights to El Calafate in Patagonia with both LAN and Aerolineas Argentinas. There are three airlines that operate flights to Chilean and Argentinean Southern Patagonia: LAN, Sky Airlines and Aerolineas Argentinas. Because there are several options each day to fly down to Patagonia, we strongly encourage guests to book their flights through Quasar Expeditions in order to book the correct flights and at the best rates. We charge the same cost as if booked directly with the airline, but save you all the hassle of figuring out which flights work best for you. Please contact us for flight quotes. Air tickets prices will depend on your to/from cities and travel dates. If booked well in advance, flights to Patagonia can cost about US$250, but they can go up to US$700 if booked last minute.